Fielder, H. Pink Floyd Behind the Wall, New York, 2013, illus. pp. 162, 174. Guesdon, J-M. and Margotin, P. Pink Floyd: All The Songs, New York, 2017, illus. pp. 495, 498, 501, 503, 508, 527, 531, 533, 545, 574. Popoff, Martin. Pink Floyd: Album By Album, Minneapolis, 2018, pp. 187, 202, 214. Povey, G. and Russell, I. Pink Floyd: In The Flesh, London, 1997, illus. pp. 193, 194, 197, 204, 237. Taylor, P. Pink Floyd: The Black Strat - A History of David Gilmour's Black Fender Stratocaster, London, 2017, illus. pp. 136, 137, 142, 145-147, 159. Guitarist, May 2015, illus. p. 68. Guitar for the Practicing Musician, October 1988, Volume 5, No. 12, illus. cover, pp. 3, 76, 85. Guitar Magazine, September 1995, illus. cover. Guitar Player, November 1984, Volume 18, No. 11, Issue 179, illus. cover. Pink Floyd Interstellar, Cité de la Musique, Paris, France, 10th October 2003 – 25th January 2004. Pink Floyd: Their Mortal Remains, Victoria and Albert Museum, London, 13th May – 15th October 2017. Besides the Black Strat, no instrument is more closely or immediately associated with David Gilmour than his Candy Apple Red 57V Stratocaster, which replaced The Black Strat as his principal guitar for almost twenty years, becoming a symbol of the Gilmour-led Pink Floyd era. Acquired from the CBS Fender UK warehouse in Enfield, Middlesex in early 1984, the Candy Apple Red Stratocaster was one of the second batch of guitars Gilmour hand selected from Fender’s new reissue line, having already taken delivery of a 57V in Vintage White (lot 53), known as the Cream #1, along with a 62V Stratocaster in Fiesta Red, a 52V Telecaster and a Stratocaster Elite (lot 51) that January. In a 1985 interview with John Stix for Guitar For The Practicing Musician, Gilmour enthused …the new Fender Vintage Series guitar I bought is probably as good as any Fender I own, old or new. At that time preferring their sound to that of the Black Strat, the vintage reissues became Gilmour’s guitars of choice, leaving The Black Strat to take a back seat for a while. Although the Red #1, as Gilmour refers to it, was first seen in promotional shots for Gilmour’s second solo album About Face, released in March 1984, it was the Cream Strat that served as the main guitar on the subsequent tour. Following the tour, the guitar was used during mid-1984 recording sessions at London’s AIR Studios for Paul McCartney’s 1984 soundtrack album Give My Regards to Broad Street. Gilmour performed a memorable solo on the McCartney ballad No More Lonely Nights, requesting that his session fee be donated to a charity of McCartney’s choice. Now fitted with EMG SA pickups and SPC and EXG tone controls to eliminate noisy audio interference, the Red Strat made its first stage appearance at the legendary Live Aid concert in London’s Wembley Stadium on 13th July 1985 when Gilmour played a short set as part of Bryan Ferry’s band, including Sensation, Boys and Girls, Slave to Love and a cover of John Lennon’s Jealous Guy. Live footage of the show reveals the moment the Red #1 saved the day, promoted from spare to superstar when Gilmour’s sunburst 57V Stratocaster (lot 55) failed during the first song. Gilmour told us: It was always tricky when you have the sort of set up that we had, with a vast amount of lighting and dimmers. Our guitar technicians were constantly struggling to stop buzzes and when you use effect pedals, they tend to amplify all the bad noises. Through the 70s, the battle to not have loud hums and buzzes coming out of your amps was constant, it was a nightmare, and these pickups made by EMG in this guitar prevented that. Their low impedance electronic pickups didn’t pick up hums and buzzes and it made life so much easier on tour. They also have tonal circuitry which can boost the thickness of the guitar’s sound. When you’re playing solos the high notes can sometimes get a bit thin on a regular Strat and this guitar had a solution for that and it became my go to guitar for quite a while. This guitar has served me very well. From Live Aid onwards, the Red #1 was sometimes alternated with the Cream and used for a number of performances with Pete Townshend’s Deep End band in the mid-1980s including an appearance on cult British television show The Tube on 11th October 1985, two nights at London’s Brixton Academy on 1-2nd November 1985 in aid of Townshend’s Double O charity and a show at the Gala du Midem in Cannes on 23rd January 1986, broadcast on the German television show Rockpalast. The Red Strat became Gilmour’s principal recording guitar when Pink Floyd returned to the studio in November 1986 to record their thirteenth studio album A Momentary Lapse of Reason aboard Gilmour’s newly appointed houseboat studio the Astoria, The Black Strat having been loaned to the Hard Rock Café that August. Immediately following the album’s release on 7th September 1987, the band embarked on an enormous world tour in support of the album. Although alternated with the Cream Strat during the first North American leg of the tour, Gilmour began to use the Candy Apple Red Stratocaster exclusively as his main performance instrument following some modifications and repairs by Greg Fryer during the Sydney dates in February 1988, which lowered the pickups to more closely approximate the tone of his true vintage Stratocasters. By the time the band had racked up almost 200 shows, playing such extraordinary locations as the Palace of Versailles and Venice’s Grand Canal, the wildly successful tour closed as the highest grossing of the 1980s. The Floyd’s series of shows at New York’s Nassau Coliseum in August 1988 were recorded for the 1988 live album Delicate Sound of Thunder and the 1989 live concert video of the same name. In between shows with Pink Floyd on the third North American leg of the tour, Gilmour made an appearance at the Les Paul Tribute Concert at the Brooklyn Academy of Music, New York, on 18th August 1988, performing a soulful blues solo on the Red Strat before returning to the stage for a guitar jam with a star-studded cast of musicians including Waylon Jennings, B.B. King, Steve Miller, Eddie Van Halen and Les Paul. Gilmour recalls that after B.B. King heard him play, he approached him with the plaudit Hey, boy, are you sure you wasn't born in Mississippi? The full show was released on VHS in 1988 as Les Paul & Friends: He Changed the Music. The following year, Gilmour laid down guitar parts on the Red#1 for the track Sasha on Michael Kamen’s 1990 Concert for Saxophone with David Sanborn. Ahead of a guest appearance with John Martyn at the Shaw Theatre, London, on 31st March 1990, Gilmour appeared with Martyn on the Channel 4 documentary show Rock Steady, wielding the Red Strat for a performance of Look At The Girl, switching to his EC Stratocaster for the subsequent live concert. Alongside Gilmour on his EC Stratocaster (lot 74), Dire Straits’ Mark Knopfler briefly borrowed the Candy Apple Red 57V Strat for a light-hearted performance in a courtroom-based French and Saunders comedy sketch aired on the BBC on 19th April 1990. A couple of months later, Gilmour played a short set on the Red Strat with Pink Floyd at Knebworth on 30th June 1990 for a historic charity concert in aid of the Nordoff-Robbins Music Therapy Centre. The band topped a bill of legendary Silver Clef Award Winners including Paul McCartney, Eric Clapton, Dire Straits, Elton John, Genesis, Robert Plant (with guest Jimmy Page) and Status Quo. Gilmour continued to favor the Candy Apple Red Strat for various guest appearances through the 1990s, performing at a number of charity events including the Red Balloon Ball at London’s Alexandra Palace in aid of The Lung Foundation on 6th December 1990, the Rock-a-Baby charity concert with an all-star band at London’s Hackney Empire Theatre on 1st February 1991, the Chelsea Arts Ball in London’s Kensington for the Aids Crisis Trust on 11th October 1991, and Amnesty International’s Big 3-0 with Jools Holland on 28th December 1991, accompanying Seal in his rendition of Hey You and Tom Jones on Kiss. Gilmour also contributed guitar on a couple of tracks on All About Eve’s 1991 album Touched By Jesus. The guitar was next seen at The Cowdray Ruins Concert on 18th September 1993 in aid of the local King Edward VII Hospital. Set amongst the ruins of Cowdray Castle in West Sussex, the spectacular line up also included Queen’s Roger Taylor and John Deacon, Genesis and Eric Clapton. With Genesis’ Mike Rutherford on bass, Pink Floyd performed three songs – Run Like Hell, Comfortably Numb and Wish You Were Here – before returning to the stage with the full line up for a jam of Ain’t That Peculiar and Gimme Some Lovin’. Back in the studio, the Candy Apple Red Strat was used during 1991 recording sessions for Pink Floyd’s soundtrack to La Carrera Panamericana, a 1992 retrospective documentary film of the seven-day sports car race held in Mexico, thereafter serving as the principal guitar during recording of the band’s 1994 album The Division Bell. Footage from the 1993 The Division Bell sessions, seen in the 1994 BBC TV Omnibus Pink Floyd - The Story, as well as 2014 promotional videos for the Endless River, show Gilmour jamming on the Red Strat alongside bandmates Nick Mason and Richard Wright at the Astoria. The guitar was again employed as Gilmour’s main stage instrument on The Division Bell Tour from March to October 1994, as seen in the live concert video Pulse, released on VHS in 1995 and on DVD in 2006. The tour marked the first time since 1975 that the band had played their seminal masterpiece The Dark Side of the Moon in its entirety. Closing as the highest grossing tour in history at that time, it would turn out to be the last Pink Floyd tour. It would not be the last Pink Floyd album, however, as unused material recorded on the Red Strat during the 1993 The Division Bell sessions was later revisited and reworked between 2013-2014 for the band’s final album The Endless River. The guitar was next seen on 29th June 1996, when Gilmour made a special guest appearance with The Who at The Prince’s Trust Concert in London’s Hyde Park, playing the last four numbers of The Who’s rock opera Quadrophenia. Gilmour subsequently used the guitar to record Cryin' Won't Help You Babe for B.B. King’s 1997 album Deuces Wild, afterwards appearing with King on Jools Holland’s 5th Annual Hootenanny for a performance of Eyesight To The Blind on the Red Strat. 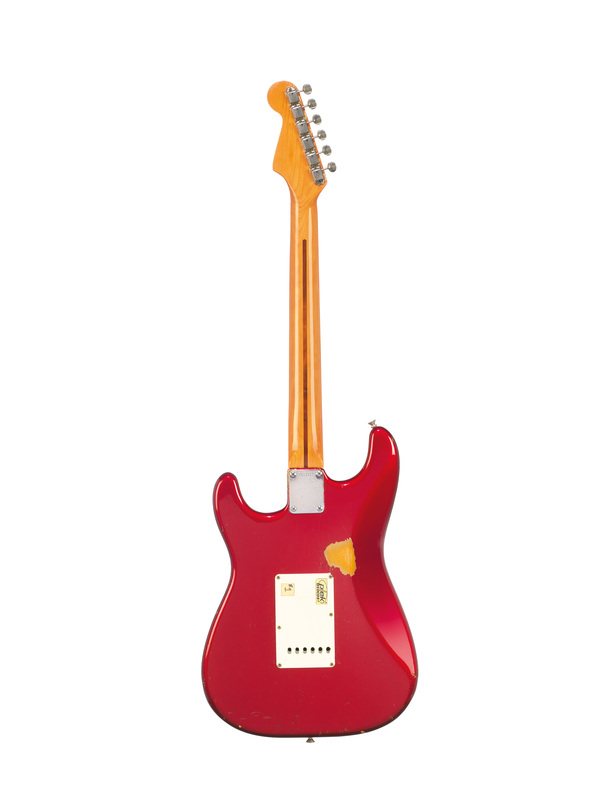 Notably, Gilmour selected the Candy Apple Red Stratocaster for a performance at London’s Wembley Arena on 24th September 2004 to celebrate 50 years of the Fender Stratocaster. As part of a stellar line up of guitar greats paying tribute to the iconic instrument, Gilmour performed the track Sorrow on the 1984 57V Stratocaster, together with Marooned and Coming Back to Life on his 1954 0001 Strat (lot 20). The reign of the Red was to come to an end, however, when The Black Strat made its triumphant comeback for the historic reunion of David Gilmour, Nick Mason, Richard Wright and Roger Waters in their classic-era Pink Floyd line up at Live 8 in London’s Hyde Park on 2nd July 2005, their first performance together in 24 years. 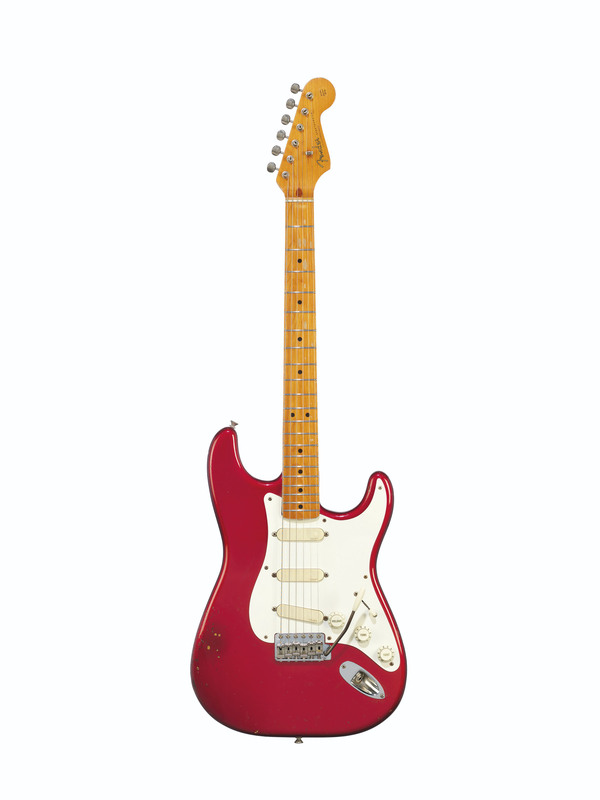 Although the Black Strat had reclaimed its position as Gilmour’s No.1 guitar, there is no doubt that the Candy Apple Red Strat continued to hold a place in his affections, remaining a key fixture on Gilmour’s 2006 solo tour for performances of the Syd Barrett tribute Shine On You Crazy Diamond. Used for hundreds of performances throughout Pink Floyd’s most intensive touring period and captured in countless photographs and live recordings, it could be argued by some fans that the Red Strat is the more instantly recognizable Gilmour guitar. With its unique tone, the Red Strat inspired some of David Gilmour’s most memorable performances and defined the sound of the Gilmour-led Pink Floyd.